Nadje Al-Ali is Professor of Gender Studies at the Centre for Gender Studies, SOAS University of London. Her main research interests revolve around feminist activism; transnational migration and diaspora moblization; war, conflict and peace; as well as art & cultural studies; mainly with reference to Iraq, Egypt, Turkey and the Kurdish women’s movement. Her publications include What kind of Liberation? Women and the Occupation of Iraq (2009, University of California Press, co-authored with Nicola Pratt); Women and War in the Middle East: Transnational Perspectives (Zed Books, 2009, co-edited with Nicola Pratt); Iraqi Women: Untold Stories from 1948 to the Present (2007, Zed Books); Secularism, Gender and the State in the Middle East (Cambridge University Press 2000) as well as numerous book chapters and journal articles. Her co-edited book with Deborah al-Najjar entitled We are Iraqis: Aesthetics & Politics in a Time of War (Syracuse University Press) won the 2014 Arab-American book prize for non-fiction. Nadje is a member of the Feminist Review Collective, and is on the editorial board of Kohl: a journal of body and gender research. 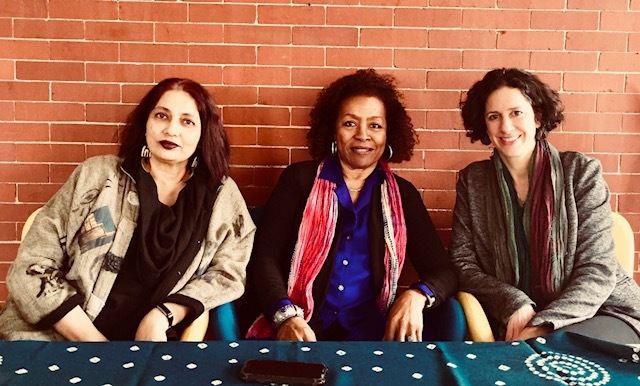 She has been involved several feminist organizations based in the Middle East, particularly Egypt and Iraq, but also in several transnational feminist organizations such as Women in Black and Women against Fundamentalism. Nadje was a founding member of Act Together: Women against War and Sanctions in Iraq.